Newcastle Emlyn town community has come together again to bring you the Newcastle Emlyn Food Festival on 8th June 2019. For the eigth year running, the King George V playing field will be filled to the brim with all things fun and foodie! Newcastle Emlyn lies in a bend of the River Teifi and has been a significant trading town since the 13th Century. This vibrant market town nestled in rich surrounding farmland has the most wonderful varied food related businesses in its locality. 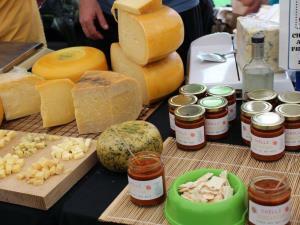 With more than thirty local producers lining up again to present their fantastic produce to you. There is so much choice beers, cheese, incredible vegetarian sauces & salsa, pasta and the most delicious cakes. More information can be found on the Facebook page Gwyl Fwyd Castell Newydd Emlyn Newcastle Emlyn Food Festival (don’t forget to “like”!) or follow us on Twitter @gwylfwydcne .